We already know that the Bulls are a better team than last year. We already know this season is better than last year. What we don’t really know yet is how much better the team is, and how much better this season will be. Those answers will start to come Saturday against the defending MAC Champions. Last year, during the Broncos undefeated conference season, they beat the Bulls 38-0. UB battled hard in that game, and trailed only 14-0 at halftime. But eventually Western Michigan cruised to that final score. This year’s Broncos don’t have stars Corey Davis and Zach Terrell. But they are still one of the best teams in the MAC. Both squads are on three game winning streaks, and riding a wave of confidence. The Bulls are doing the things that good teams do to win: run the ball, stop the run, control the game. How much they can do that against one of the league’s best, will provide us some answers. Regardless of the final score, we’ll have a good measuring stick for the 2017 Bulls. Bull Session Trivia: Corey Davis was taken by the Tennessee Titans with the 5th pick in the first round of the 2017 Draft. In the last five drafts, he’s the third MAC player taken in the top five. Who are the other two? Drew Anderson will make his second straight start for the injured Tyree Jackson. Against Kent State, Anderson did everything you want from a backup QB. Plus more. He was efficient, in control and mistake-free beyond an early interception. His 64 yard read-option run was the biggest play on the biggest drive of the game. The throw to Zac Lefebvre that capped off that drive was a great touch pass. Anderson admitted he was nervous to start. But as he settled down, he looked just like the quarterback that drew rave reviews from his coaches and teammates the last two years. 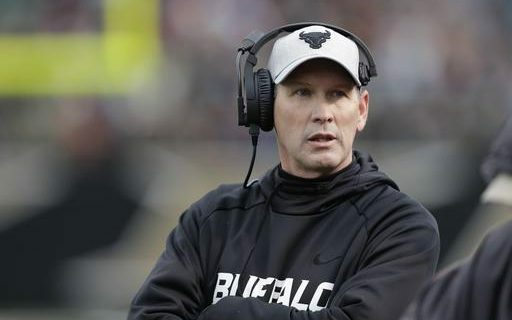 Head Coach Lance Leipold had no doubts. “I know he’s prepared.”…With 371 yards rushing in the last three games, Emmanuel Reed is now 4th in the MAC in rushing. Again, Leipold is not surprised. He remarked that Reed has shown that running ability in practices and scrimmages, and has figured out how to use his quickness to his advantage…David Goldsby returned from missing the first four games, and slid right into his spot at right tackle. That allowed Jacquis Webb to move back to left tackle, where he shared time with Evan Ksiezarczyk. Another example of the growing depth of the Bulls roster…Bulls tight ends continue to come up with big plays. Tyler Mabry has 58 & 28 yard catches over the last three games. Lefebvre made a big 29-yarder on the 99-yard drive, and then caught the key touchdown…The Bulls have eight plays of 45 yards or longer, with two more coming against Kent State. Last year, in 12 games, they had five…Anthony Johnson has seen more tight coverage, and always the opponent’s best cornerback. Yet his 26 grabs rank third in the MAC…He’ll see one of the top corners in the MAC with Darius Phillips. He is the most dynamic player in the league. Phillips has scored 13 touchdowns in five different ways. He has four career interception TD’s, five kickoff return TD’s, 1 fumble return, 1 punt return and 2 touchdown catches. This season, Phillips has 100-yard kickoff returns for scores against USC & Michigan State. It will be interesting to see if he follows Johnson, or if the Broncos stick to sides and allow the other corner, Sam Beal, to cover AJ…The linebackers are the key to the Broncos defense. Asantay Brown leads the team with 38 tackles and two sacks. Brown is the cousin of Bulls quarterback Tyree Jackson…The Broncos have forced 10 takeaways on defense. The UB defense is now second in the MAC, allowing only 18.4 points per game. They continue to be great at not giving up big plays. Although Kent State did have a 76 yard TD pass, the Bulls D has allowed only two touchdown passes and just eight passes of 20 yards or more…A lot of that coverage is coming without injured cornerback Cam Lewis. Last Saturday, Roy Baker got his chance in the CB rotation. The redshirt freshman had a career-high 8 tackles…The cornerback position now goes five-deep, and has been one of the most improved positions on the team…Tatum Slack has 8 passes defended, good for 2nd in the MAC…Khalil Hodge continues to be a tackling machine. He had 11 more against Kent State. He’s averaging 12.8 per game, good for #1 in the MAC and #3 in the country…Jordan Collier, the Bulls outside linebacker, had his best game with 9 tackles, 1 sack and 3 tackles for loss…John Wassink has replaced Terrell as the Broncos quarterback. He’s been very good, with 7 touchdowns and just 2 interceptions. The Broncos are so good at running the ball, that Wassink hasn’t had to do too much…Expect the Bulls to see three different running backs. All three are among the best in the MAC. Jarvion Franklin the power back at 225 pounds. His 3,834 yards are 5th among all active NCAA backs…Jamauri Bogan is the shifty scatback. Similar to Reed in size, he’s 5th in the MAC in rushing with a career rushing average of 5.7…LeVante Bellamy is the speed/size combination back. He’s averaging 7.1 yards per carry…All three running backs have had a 100-yard game this season…Broncos left tackle Chukwuma Okorafor is legitimate NFL prospect. The six-foot-six, 330-pounder is rated as one of Mel Kiper’s top five tackles for the 2018 NFL Draft…Last week, the Broncos used Phillips on offense at wide receiver. He played that position as a freshman. Phillips ran once, and caught two passes against Ball State. Emmanuel Reed is off to one of best starts ever for a UB running back. He’s run for over 100 yards in three straight games. Remember, that first 100 yard was against Colgate, when Reed came off the bench. No UB running back has ever had over 100 yards in his first three starts. Reed has a chance to do that Saturday. He would be the first since Anthone Taylor in 2015 to top the century mark in four straight games. Bull Session Trivia Answer: In 2013, the Kansas City Chiefs selected Central Michigan’s Eric Fisher with the #1 overall pick. In 2014, the Oakland Raiders took UB’s Khalil Mack with the 5th overall pick. Please join me, color analyst Scott Wilson, game host Brad Riter and postgame host Bob Gaughan for the broadcast on the Bulls Football Network. Our special two hour pregame show starts at 1:30pm. You can hear it in Buffalo on ESPN 1520 and in Rochester on Fox Sports 1280. A link to the online broadcast is also available here and on the Tune In app.